The ThruNite TN12 makes a good investment if you are in the lookout for a bright flashlight with light and handy body. This new flashlight is the update of the previous TN12 and is a good option if you are in need of a new EDC light. Being compact, easy to grip, and balanced brightness are just of the good things in store for you once you lay your hands on one. Presently, the ThruNite TN12 usually sells for a reasonable price online. The price is cheaper than other brands at the top of the market. At the moment, it is well-renowned in its category due to outstanding feedback from satisfied users. Many customers rave that it beats other brands in terms of performance, reliability, and selling price. ThruNite has been selling premium flashlights since the year 2009. From then till now, the company strives to provide affordable and unmatched-quality products to their consumers. Through the products they offer, they strive make others’ life a breeze and convenient. The flashlight has a pocket clip that is not stiff and is not going to ruin your pants or bag along the way. The clip is also in good shape and makes sure that the flashlight is securely attached. When you purchase a package, it’s housed in a cardboard box with foam padding inside. This ensures that your flashlight and its accessories are safe inside. At the top of the foam is the TN12 EDC LED Flashlight, and underneath are its accessories, which includes the holster, the O-rings, and lanyard. A loop for belt mounting is also included. At the side of the TN12 is the side switch, which is designed with a round shape. At first touch, you will notice that it has a comfortable feel and easy to fiddle with. The switch is also coated with silicone, making it faster to locate even in the dark. Actually, amongst all flashlight we’ve tested, this has been the quickest to find so far. The nice black finish was also perfect – it was anodized and embellished with rectangular cut threads to give you a non-slip feel. The battery tube is made with incredible thickness, making it durable and secure enough to hold the batteries. On the other hand, the tail switch provides easy access to the user. You can turn it off or on with no sweat if you need to. It also features a momentary on option, allowing for breezy operation. This can be activated by using half press. A closer look at the exterior will leave you in awe seeing how it is made with great care to detail. The interface is also impressively straightforward and does not take much time for one to get used to it. Like other standard flashlights in the market, it boasts 5 different modes; namely 1050 lumens, 800 lumens, 280 lumens, 20 lumens, and 0.3 lumens with additional hidden strobe. To switch between these modes, simply push the switch depending on your preference. Short press for choosing brightness or press and hold when strobe mode is desired. Another bonus for users of the TN12 is the instant memory feature. This means it remembers the last mode used for more ease. However, this feature is not usable when strobe mode is preferred. Sometimes you want only a bit of light instead of the very bright one. This is when the Ultra Low option comes in handy. Strobe mode is also one of the best we’ve witnessed. If you’re using the flashlight for self-defense, you can easily disorient your attacker with its kicking light. Be careful when using it by yourself though, as you may start seeing multiple images too. 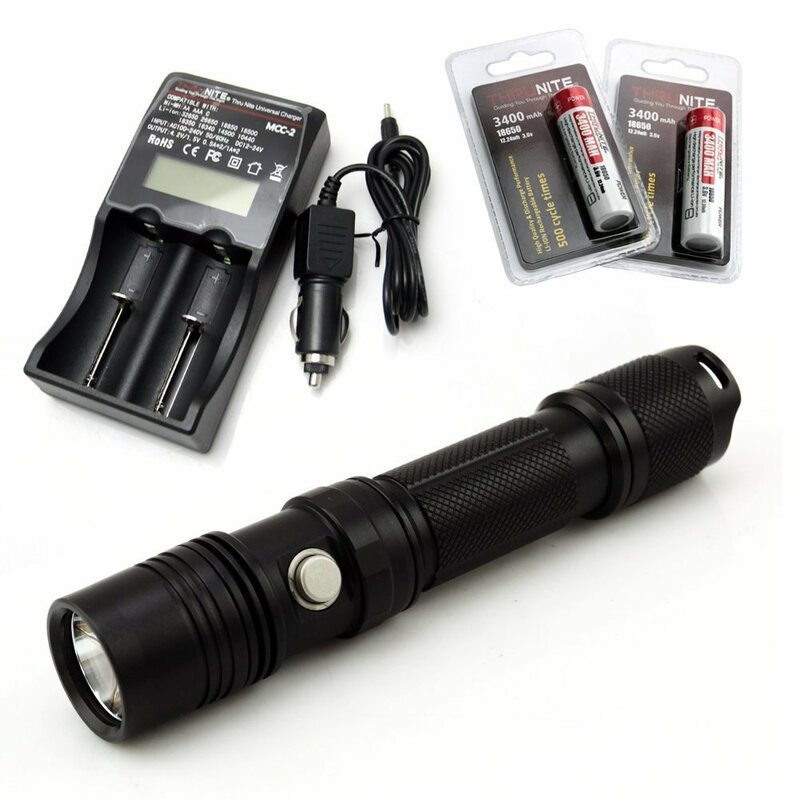 Based from our observations, the ThruNite TN12 makes an excellent choice since it has adequate brightness, has all the useful features for illumination and self defense. In addition, it warns you when the flashlight is running out of batteries, flashing the light twice every 10 seconds. Moreover, the highly efficient flashlight uses Cree XM-L2 U2 LED, a powerful technology that’s built to light you up in the dark for an extended time.